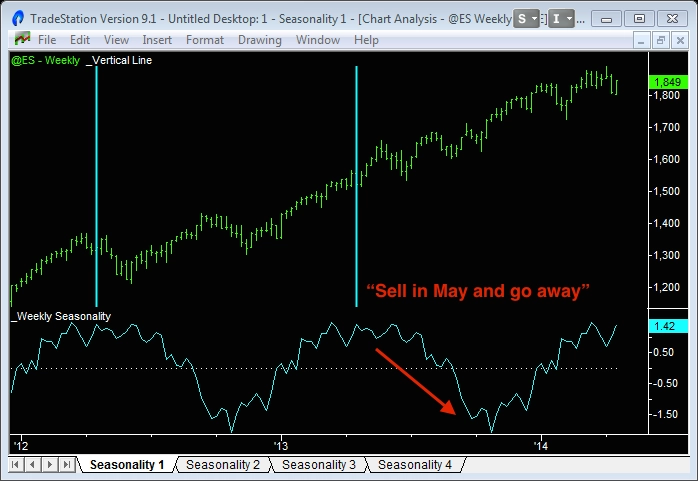 Stock market seasonality definitely exists, but can you use it day trade? I think the answer is “Yes” – but only where there is strong fundamental support. Looking for annual statistical anomalies just isn’t enough. Just because on average the market did “this” (up/down x% on this particular day) over the last 10 years, doesn’t mean it’s going to happen again. Look for annual patterns that have real reasons for occurring – earnings, tax time, index re-balancing, etc. Drivers that are fundamental. “Just wanted to send a quick note to say ‘Thanks’ for the free seasonality indicators. Very cool. I’ve been focusing on swing trading lately (using your indicators, of course) and these are great additional tools.” John J. “It seems you’ve come up with a brilliant new approach to seasonality! Thank you.” Ron F.
Here are 5 seasonal trades that have good fundamental support, including one that is firing right now. The weekly seasonality indicator shows the stock market has two major biases each year. One up leg starting in late October and running until the end of April the following year. Then the down leg starts in early May and continues until late October. The variation in this pattern from year to year though is huge. If you plot each year on top of each other, you’d swear there was no discernible pattern. And the annual trend can easily disguise any seasonal strength or weakness. For example, in 2013 the market continued to power ahead, even through the “sell in May and go away” traditionally weak season. Santa Claus Rally: Strength from mid-December to the first week in January. Driven by bullish holiday spirit and investment flows into value and small cap stocks. Approximate dates: 19 December to 9 January. Tax Time: Weakness from early to mid April, followed by strength from mid to late April. Driven by profit taking in stocks to pay taxes, followed by investment flows into tax-advantaged vehicles. Approximate dates: 9 April to 25 April. 4th of July: Strength from late June until after 4th of July. Driven by bullish holiday spirit. Approximate dates: 1 July to 8 July. September Effect: Weakness from early September to late October. Driven by ‘tax loss harvesting’ by mutual funds, 3rd quarter profit warnings by corporates going to miss their year-end targets and reduced share buybacks (prohibited pre/post earnings announcements). Approximate dates: 19 September to 3 October. Thanksgiving: Strength during late November. Driven by bullish holiday spirit. Approximate dates: 22 November to 10 December. Followed by new investment inflows at the beginning of the new month. These big picture investment flows repeat again and again, year after year. The weekly seasonality indicator is too crude to time these seasonal trades – use the daily seasonality indicator instead. This dynamically calculates the seasonal pattern and plots the forecast for the next 3 days. During this latest Tax Time weakness (April 2014) it warned of a strong 3-day sell-off that resulted in a 65-point down move in the Emini. And we’re in the middle of the bounce back – again, part of the Tax Time seasonal pattern – as I’m writing this. And the daily seasonality indicator is forecasting it’s got 2-3 days more to run. And now a week later we can see that the 2014 Tax Time seasonal trade played out perfectly. The seasonal indicator caught the High before the market sell-off, it caught the Low as the market bottomed and forecast the strong bounce back too. A beautiful “V” reversal pattern. Don’t expect seasonal trades to work out so perfectly every time. You’ll need other indicators to time your entries and exits. But the 2014 Tax Time seasonal trade is a nice showcase of the power of seasonal indicators. 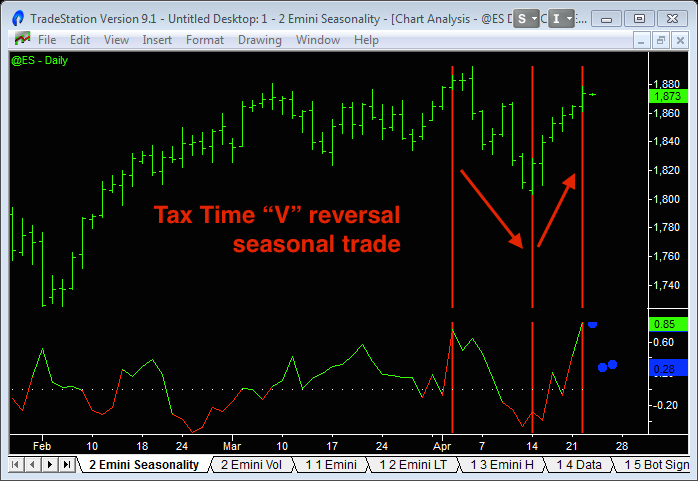 A few months after the 2014 Tax Time trade, the September Effect seasonal trade started to line up. The Emini-Watch blog warned of this upcoming seasonal weakness – which was difficult to do, as we were in the middle of a massive QE and buyback driven rally. But then the 3rd quarter profit warnings started to come in – and that’s the primary driver of this particular seasonal trade. In addition we had some big disappointments overseas: Tesco in the UK and Sony in Japan. This led to a 10% sell-off in the Emini over the next 3 weeks. Beautifully timed. If you use Google Calendar, just hit the “+” button (bottom right on the calendar below) and it will import this public Emini trading calendar into your personal Google Calendar. The calendar can also be imported into other calendar applications using these links: iCal format and HTML format. The calendar also includes important Emini trading dates, like contract rollovers and trading holidays. 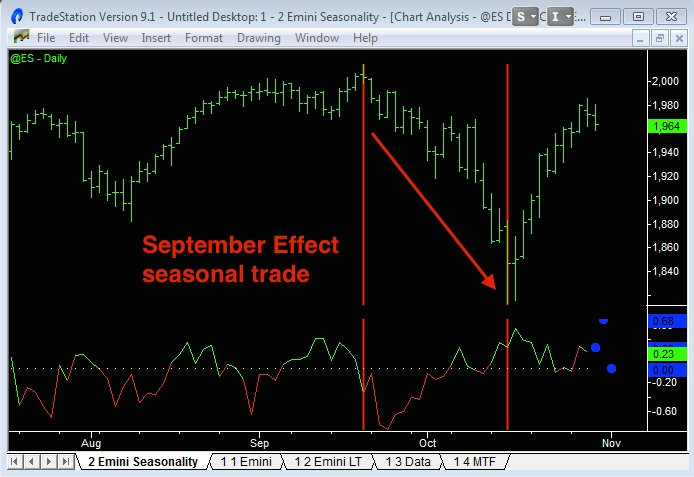 The Emini-Watch blog also tracks the latest seasonal trades here. 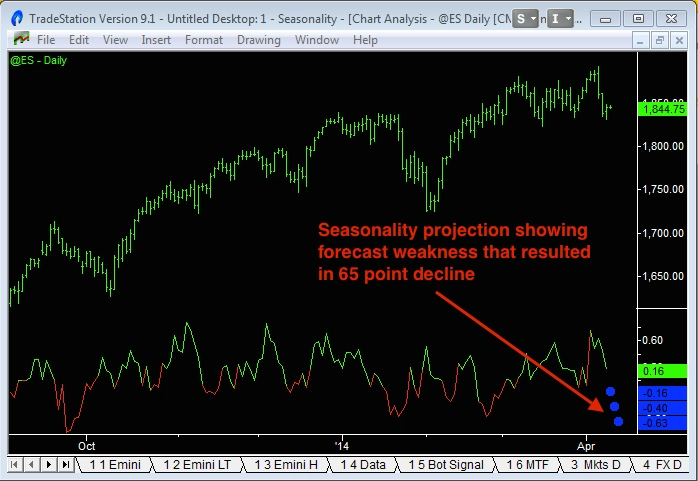 I hope this video and article on stock market seasonality were helpful to you. 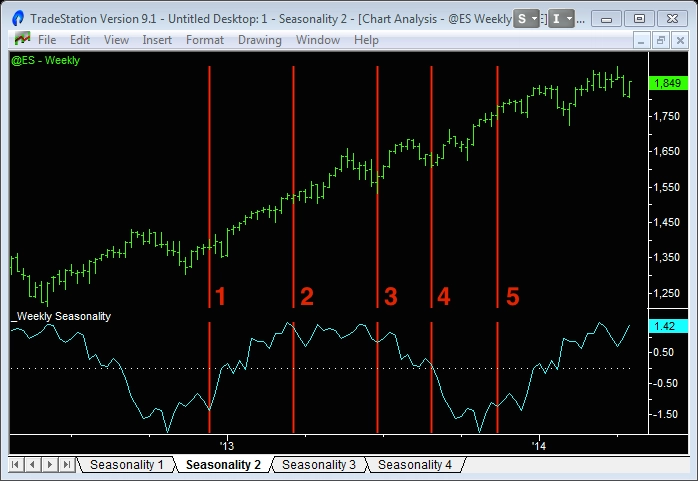 Free TradeStation, NinjaTrader and MultiCharts versions of the seasonality indicators can be downloaded below. The TradeStation download file also includes a text file with the code so you can see how the indicators work. Many thanks to Brian McKellar for coding the indicators for NinjaTrader. IMPORTANT: Please remember to plot the “_Seasonality Indicator” on daily charts with plenty of back history and starting on 1 January. This is necessary for the calculations to work correctly.